Touch up car paint with professional tips from an expert. Technology has improved our world at every level and touch up car paint methods are no exception so long as you know where to look. Old school car paint touch up applicators still exist today and typically the first product any car owner reaches out to for a quick fix. But along with these old school methods come the same poor results that are so common with clumsy applicators of old, or the ineffective pen type applicators of the latest versions in car paint touch-up applicators. Read along as I show you what I consider the better alternative to the factory OEM car paint touch up alone, but a handy kit that promises to deliver better results when used in conjunction with those factory touch-up paints. If you want to cut to the chase and see what I recommend for any do-it-yourselfer, use the secure Amazon link below and order your Langka paint chip repair kit now! Perfect fix for all your road rash problems. To be used along with factory OEM touch-up paint. Take years off the appearance of your car. Door ding chips, random paint chips, etc. This kit is designed to be used with factory OEM paint touch up commonly purchased at the car dealership, online, or at your local auto parts stores. You will need to order your factory touch-up paint first. Eliminates the unwanted bird drop effect when using traditional methods of application. See the video at the bottom of this page for Langka's DIY tutorial. The idea with touch-up paint is to camouflage the paint chips so they don't jump out at you from 20 feet away. As a car owner, you must understand the limitations of touch up car paint as a DIYer; it is far cheaper than the body shop but no fix will deliver the same results as repainting the entire panel. These methods are best reserved for actual paint chips versus scratches. Scratches must be very deep and wider in order to have a scratch that can accept paint "into" its crevice. Fine scratches must be polished out using abrasive compounds, etc. 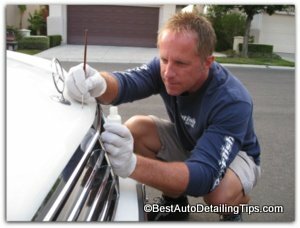 There are many areas of car care where people maintain unrealistic expectations, and touch up car paint techniques, solutions, and products is a perfect example. If you factor in the cost of traditional auto body repairs and repaint, suddenly many people find the limitations of car paint touch up a very acceptable alternative. It is a jungle out there and your car will constantly be under the assaults of the road and inconsiderate people. The ability to touch up these tiny insults as they come will keep your car looking its best as long as possible. Simply follow the instructions, stand back, and admire the ability to camouflage those chips to the point where they are almost invisible. Do me a favor and pay the information contained within this webpage forward by sharing to your favorite forum, blog, or social media site. And thank you in advance for your support!